Item # 301536 Stash Points: 1,499 (?) This is the number of points you get in The Zumiez Stash for purchasing this item. Stash points are redeemable for exclusive rewards only available to Zumiez Stash members. To redeem your points check out the rewards catalog on thestash.zumiez.com. 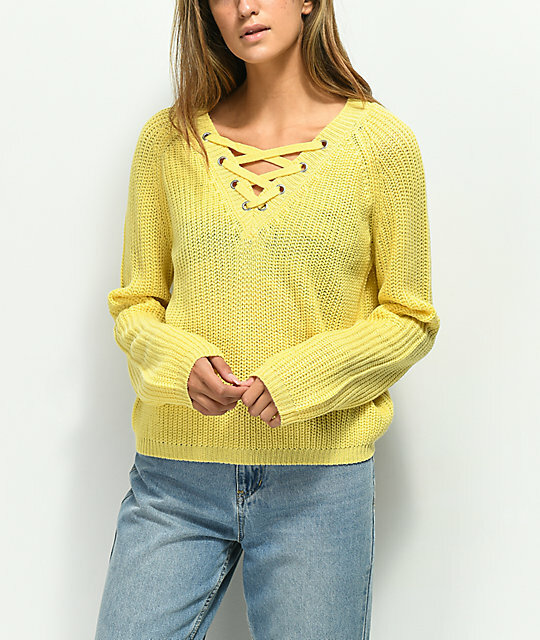 Comfort meets fashion with the Darla Lace Up Yellow Sweater from Almost Famous. This soft knit sweater offers a stretchy construction for a comfortable fit while the lace up detail at the neck adds a modern twist. Coming in a cheery yellow colorway, this cozy pullover is sure to become a staple in your closet. Darla Lace Up Yellow Sweater from Almost Famous. Lace-up V-neckline with metal eyelets.